Money Market Tips: EATING HABIT- WHY PEOPLE EAT WITH THEIR HANDS IN KERALA-GODS OWN COUNTRY. 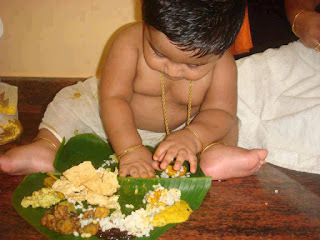 EATING HABIT- WHY PEOPLE EAT WITH THEIR HANDS IN KERALA-GODS OWN COUNTRY. You may have often wondered why people eat with their hands in Kerala. Eating food with your hands feeds not only the body but also the mind and the spirit. That is the Vedic wisdom behind Kerala's famous Banana Leaf Experience whose pleasure can only be appreciated fully, it is said, if one eats with hands and not fork and spoon. Traditionally, Indians -- not just in Kerala -- have always eaten with their hands but the experience and its virtues have been elevated to a gastronomic art by the chefs at Vivanta by Taj Bekal, a picturesque 26-acre resort in the northern Kasaragod district of Kerala, flanked by the famous backwaters and the Lakshadweep Sea. And to lend logic to the eating-by-hand experience for fussy foreigners, especially Westerners who would think twice before scooping up curry with their fingers, the maitre d'hotel lays before each guest at Latitude - the multi-cuisine restaurant with an accent on regional Kerala cuisine and a scenic view of serene waters and swaying palm fronds - captured pithily in printed paper the "Vedic wisdom behind eating with your hands". "Our hands and feet are said to be the conduits of the five elements. The Ayurvedic texts teach that each finger is an extension of one of the five elements. The thumb is agni (fire) -- you might have seen children sucking their thumb, this is nature's way of aiding the digestion at an age when they are unable to chew; the forefinger is vayu (air), the middle finger is akash (ether -- the tiny intercellular spaces in the human body), the ring finger is prithvi (earth) and the little finger is jal (water)," the paper explains. The 'banana leaf experience' has been redefined by the hotel from the traditional 'sadya', or banquet, in Malayalam, says Ashok Pillai, the executive sous chief. Sadya is traditionally a vegetarian meal served on a banana leaf on special occasions, during weddings and other celebrations. All the dishes are served on the leaf and eaten with hands sans cutlery, the palm and fingers being cupped to form a ladle. A sadya can have about 24-28 dishes served as a single course and is usually served for lunch as it is quite heavy on the stomach. Preparations begin at dawn and the dishes are made before 10 in the morning on the day of the celebration. "At Vivanta by Taj at Bekal we have given a twist to the experience by adding delectable preparation of fish or meats as per request," Samir Khanna, the affable general manager, told IANS during a recent trip. The centerpiece of sadya is navara, a medicinal rice type, that is one of the native genetic resources of Kerala and famed for its use in Ayurveda. Navara is used as a nutritional rice and health food and is said to be therapeutic for conditions such as arthritis, paralysis, ulcers, urinary tract infections, neuralgic and neurological disorders. 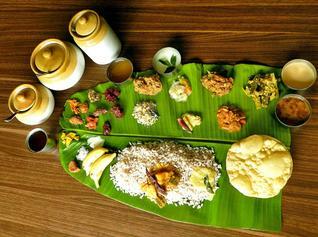 For a novitiate to Kerala cuisine, the food does not stop coming, and the helpings are as much as you can ingest. Most people stop at the second helping and react in surprise when waiters with buckets of curry offer to ladle more on the leaf-plate. Foreigners, after their initial cultural reservations about eating with their hands, awkwardly slurp and lap up the food, any messiness be damned. As a concession to non-vegetarians, karimeen or pearl spot, the local fish, is served fried or in curry form. Since the "experience" requires some preparation, those guests who want to partake of it need to intimate the chef in advance and tables are laid out separately in the restaurant for those who are eating on the banana leaf.